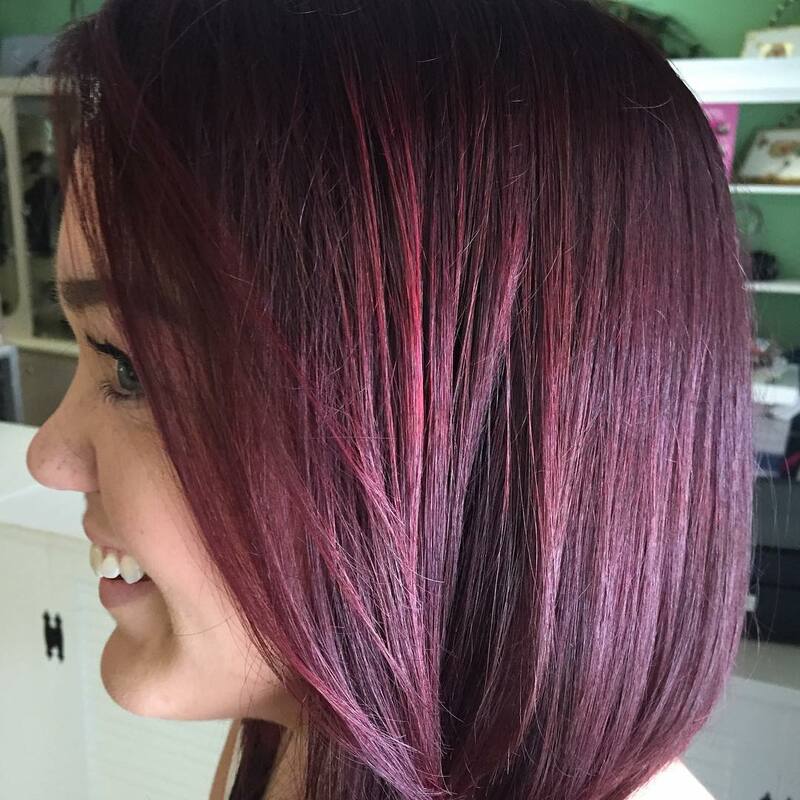 Red violet hair color is ideal for a woman who craves something that will breathe new life to her hair and is also not very common. As the name suggests, the shade is a blend of red and violet, and it has elements of both. 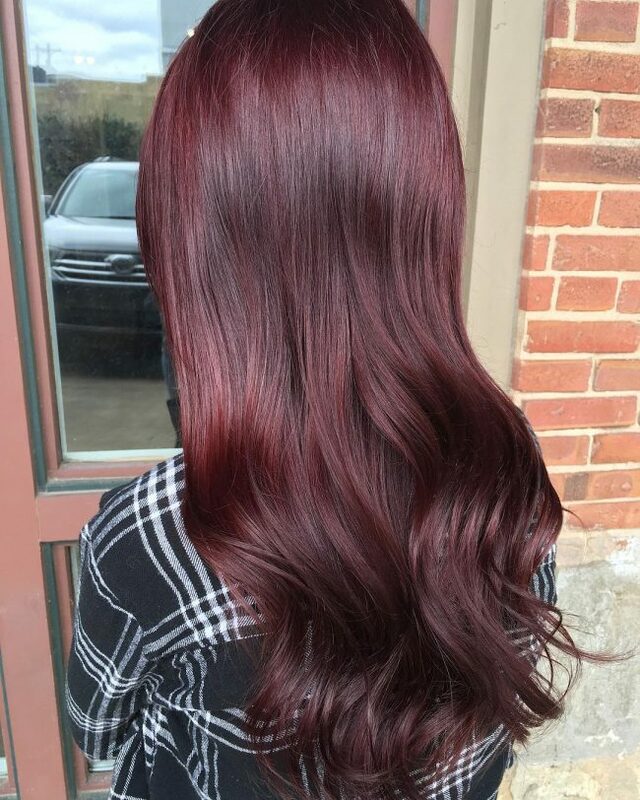 This hair tone has the brightness and elegance of red and the uniqueness of violet. There are also many techniques that you can use to dye this marvelous shade, and you can also vary its brightness and pattern to create a striking appearance. The gallery below demonstrates 50 different ways that you can wear this charming shade. You short strands should always look majestic, and you can ensure this by giving them a red violet shade. 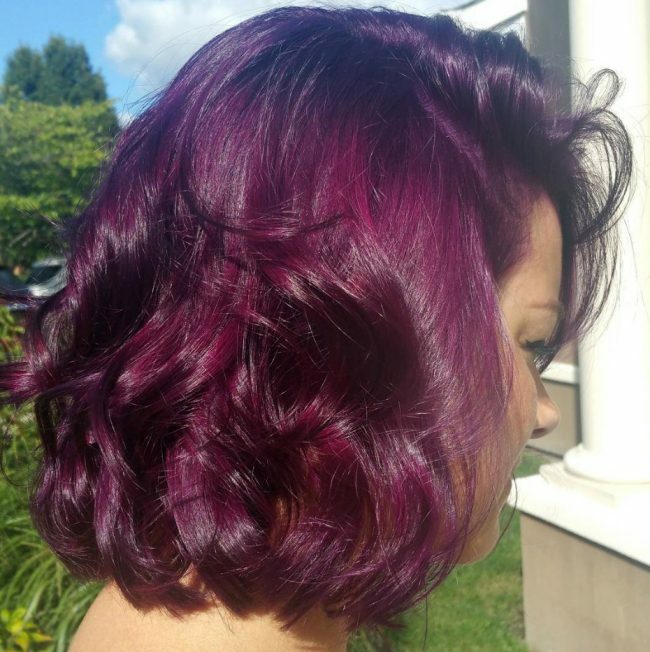 You should enhance this design by dying some of the locks with a purple shade. You also need to style your short bangs by layering and making them messy. 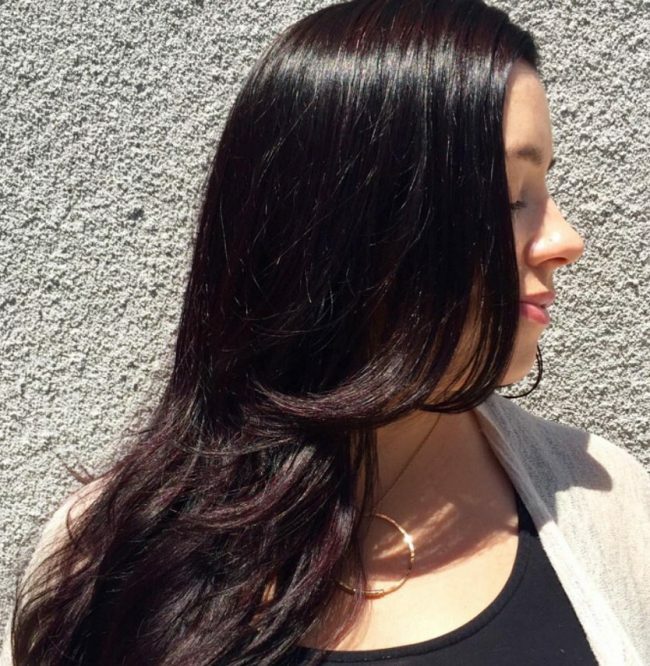 These strands have an overall dark tone that comes from using balayage to paint the red violet shade on a natural black hair. The dark shade on the base is still very visible especially in the roots, and so the red violet only gives it a slight lift. 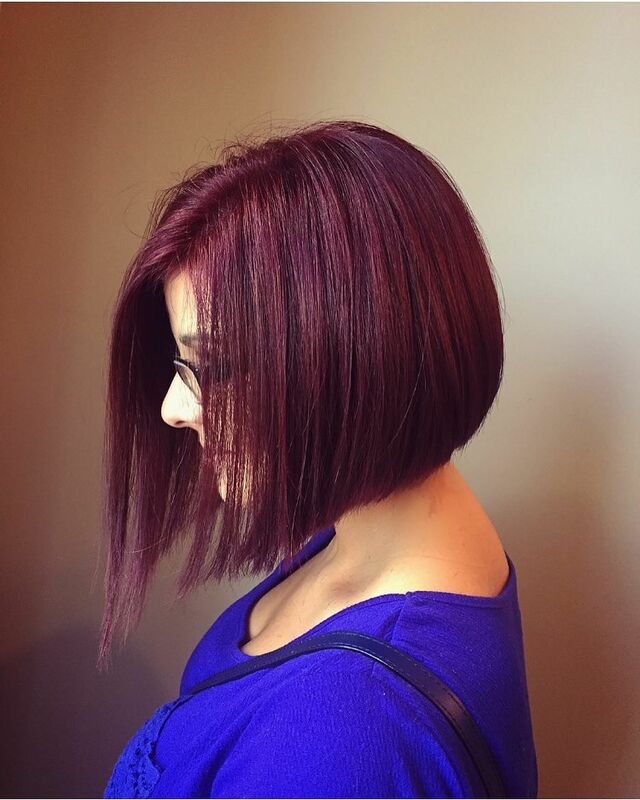 This hair also has a hint of burgundy that also adds some beauty to the design. 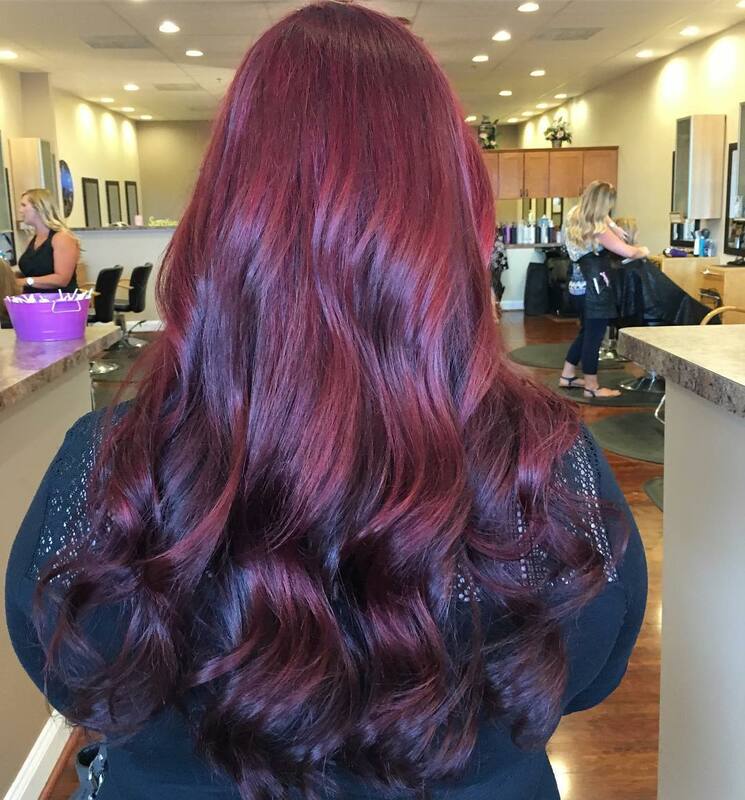 You can create this gorgeous hairdo by making red the dominant shade in your color blend. But, for your strands to look this charming you should hand paint them and make the roots darker than the ends to create a sombre design. The hairstyle is also fabulous, and it entails sweeping the thick wavy locks to the sides to create a beautiful face frame. Chocolate brown is a lovely shade but you can also blend it with other hues to create a stylish hairdo, and this hairstyle is a perfect example of this. 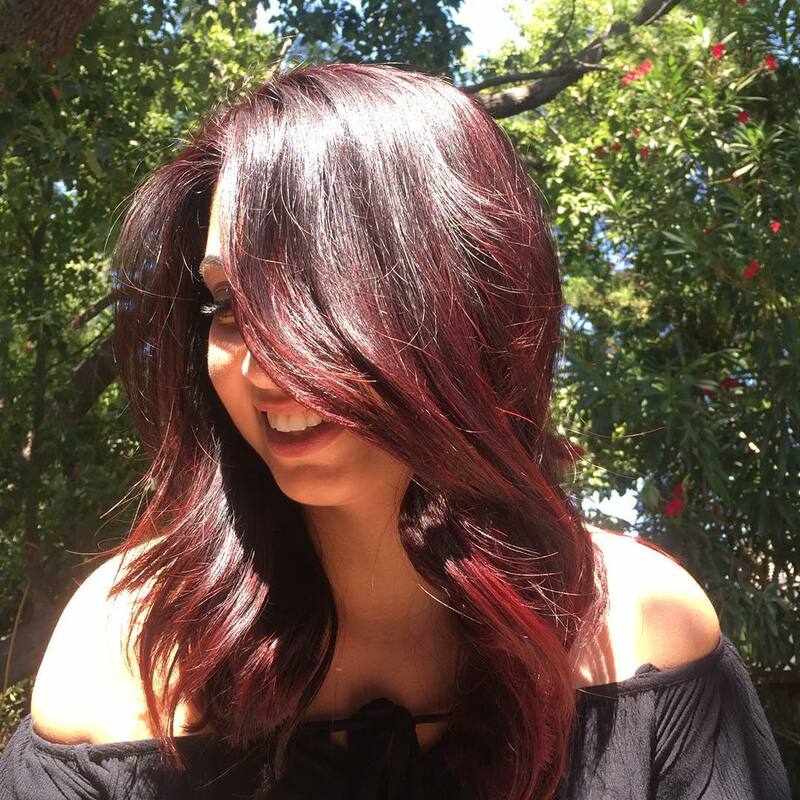 Here the chocolate brown blends with a dark red violet shade to create a distinctive and breathtaking tone. The strands also have an excellent texture, and you only need to chop the ends for some uniformity. There are many ways that you can wear red violet hair color, and this design is one of the unique ones. It entails hand painting the shade on your natural black hair to create some stunning streaks. These strands also have an amazing glow that helps to add some detail to their beautiful and thick waves. It is hard to go wrong with any color if you have a beautiful thick and curly hair like this one. 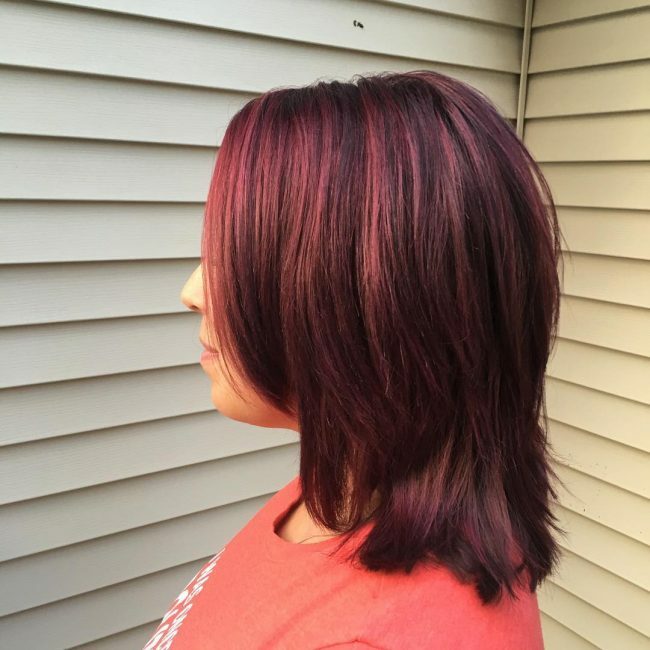 You also do not have to do much to create a stylish color design because in this style you only have to hand-paint your natural strands with a dark red violet. The thick curls in this design also make the colors detailed and you should style by sweeping them back. Even if you prefer keeping your strands short, you can still enjoy the beauty that comes with a beautiful color. 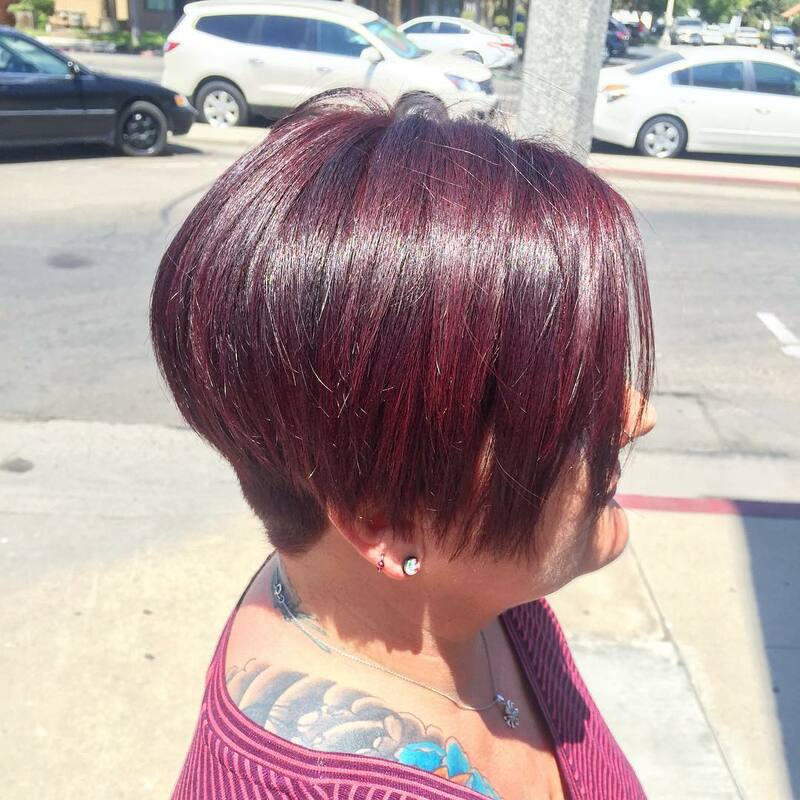 In this design, the short, blunt bob has a smooth blend between the natural black shade and a dark violet hue that make it look fantastic. 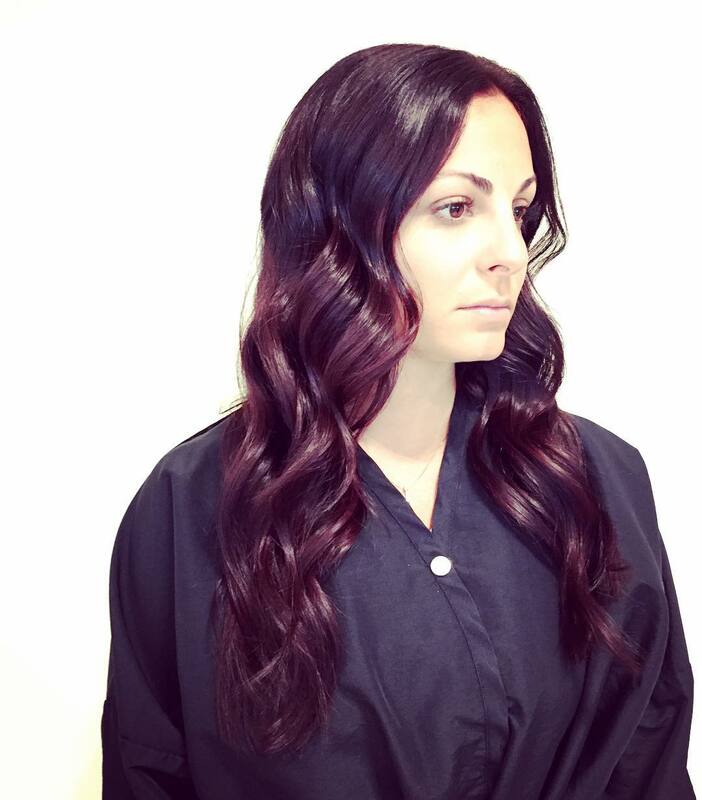 Your textured wavy locks still need a beautiful shade for them to look elegant. Few other colors will give you the same ravishing appearance that you get from red-violet. In this design, it also has a distinct dazzle that makes the locks look very healthy. 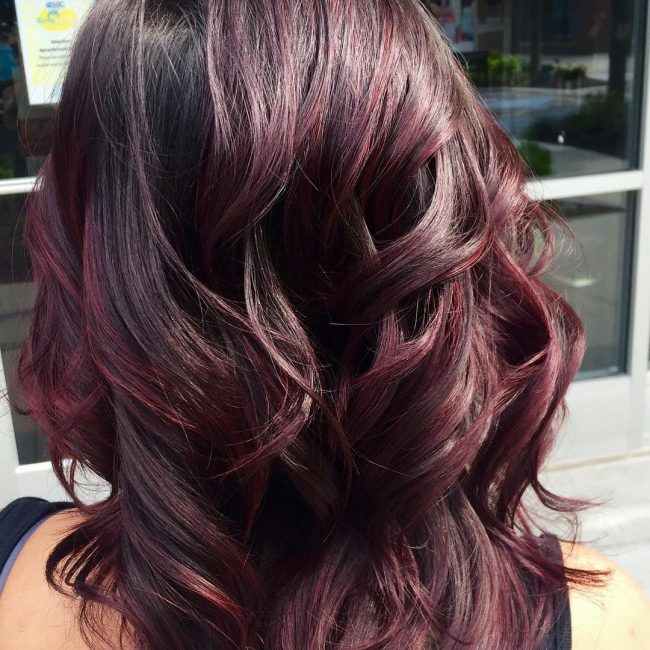 The merlot shade in this hair looks amazing, and it has a distinct dazzle that looks amazing under the sun. To create this lovely shade, you should hand-paint a blend of violet and dark red with the latter being the dominant hue. The style of the hair is also top notch, and it entails forming a center part and sweeping the wavy locks to the sides to create a face frame. An asymmetrical bob is one of the most refined short haircuts for a modern woman. However, even with all its grace you can still take its appearance class higher with some color and the medium tone and hand painted violet red hue in this design is a perfect choice. 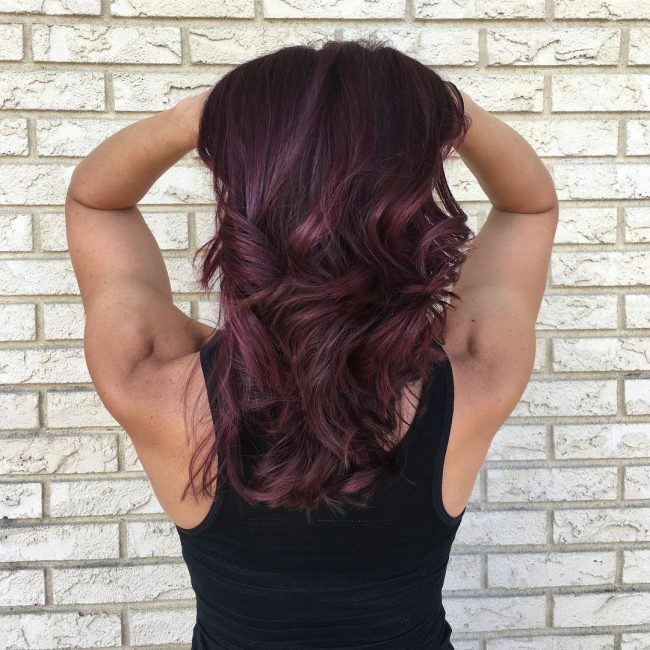 It is hard to tell that the shade on this hairstyle comes from blending violet and red because it looks more of a burgundy. This shade shows just how versatile these shades are, and it is spiced up by the face framing layers of the long hair. This hairdo demonstrates how an elegant and glamorous sombre design should look. 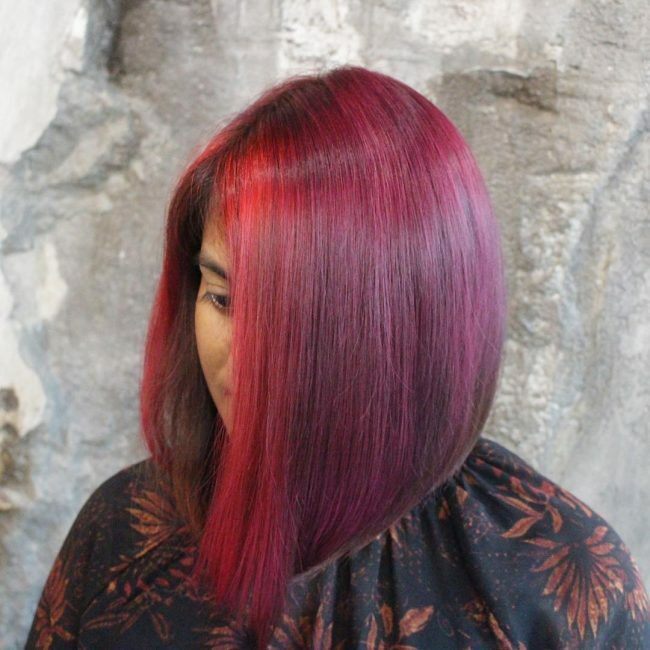 It entails transitioning from a natural black base to red-violet, and you can achieve the color pattern using balayage. The hues on this design also have a glamorous dazzle that not only makes the hair dazzle but also gives it some class. Red violet hair color comes in many hues, but most of them have the elements of burgundy like the shade in this beautiful headdress. It is very rich and almost uniform throughout and it makes the hair look quite natural. These strands also have some cute textured curls on the ends that help to spice up the overall appearance. Beach waves are stunning and timeless because you can wear them for any season. And if you give them a smooth and soft shade like the merlot in a sombre pattern in this headdress they will look fabulous. 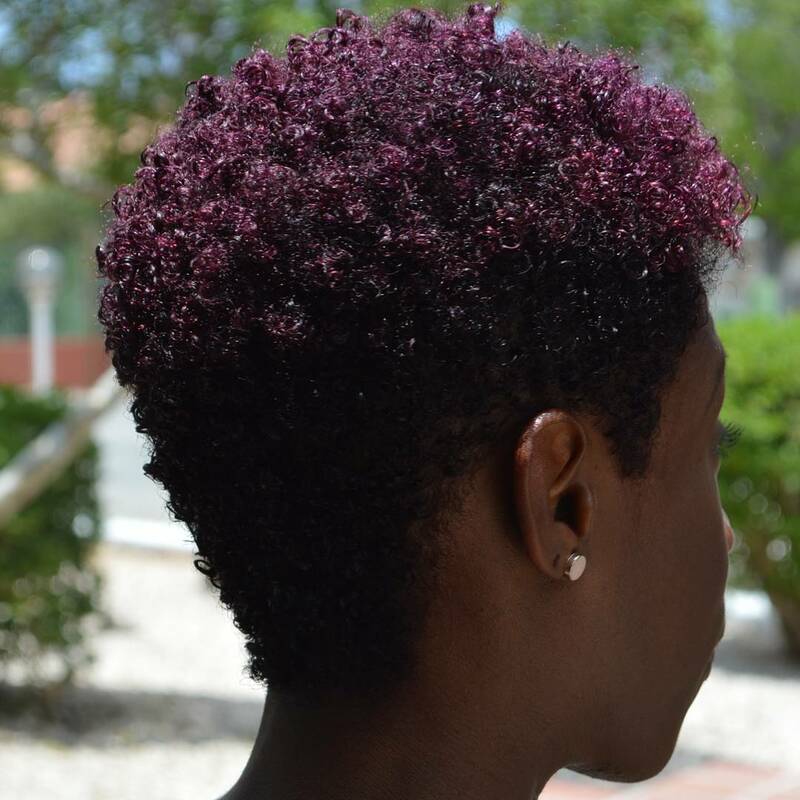 Some ladies prefer to go short and natural, but they can still enjoy the beauty of a beautiful color. In this design, the short natural curls have a nice cut that entails giving the sides an undercut. However, the plum shade is still the highlight of the design as it helps to brighten the short curly strands. 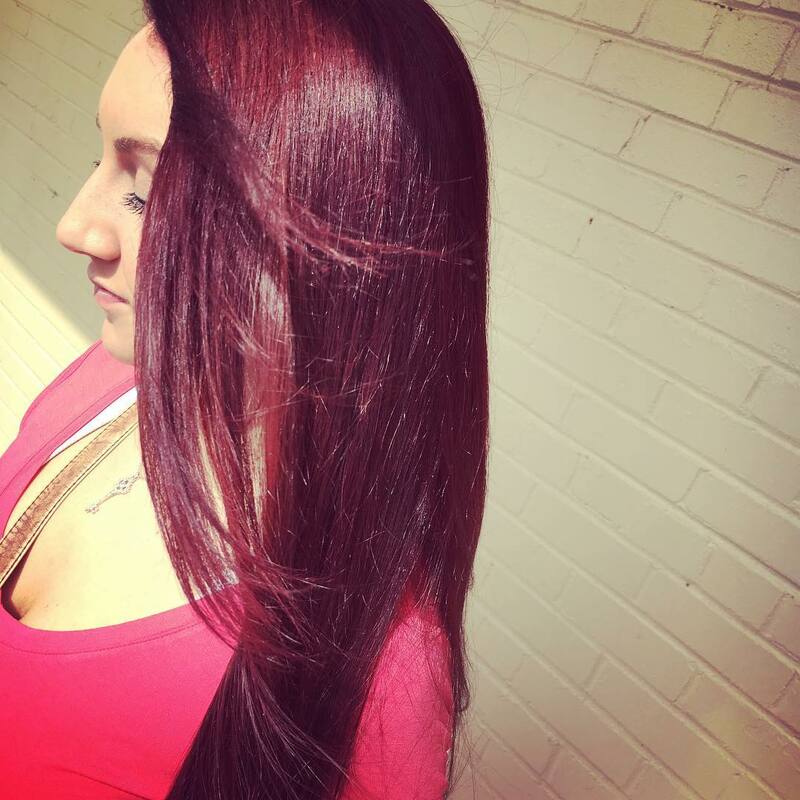 Here is another way that you can wear a merlot hue, and it is an ideal style for ladies with a long thick mane. 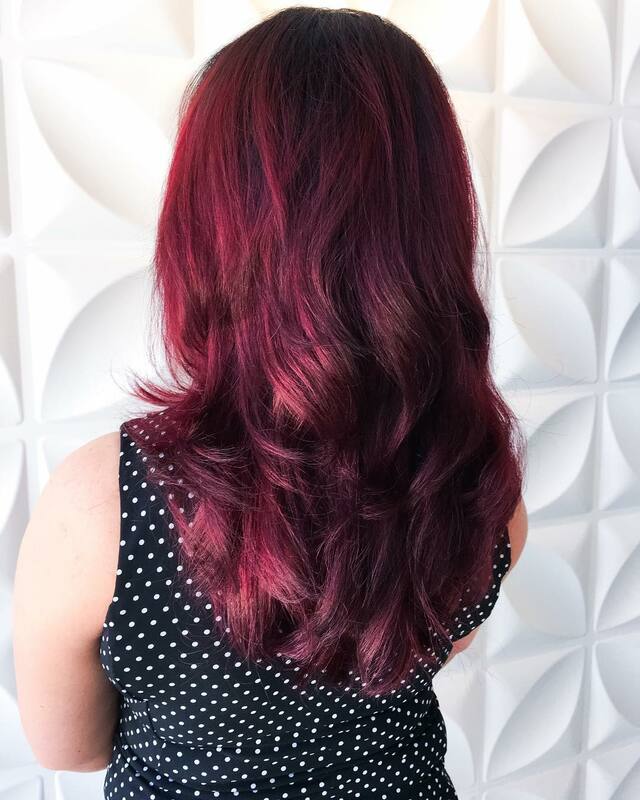 This design entails blending red and violet hues to create the merlot hue that is hand painted throughout the head and spiced up by giving it a subtle hint of pink. The hair also has some beautiful waves on the lower section, and you only need to sweep it back for styling. 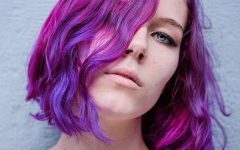 Color melting is trendy, and it makes it possible for ladies to wear several shades in the same hairdo or use them to create a distinct tone. 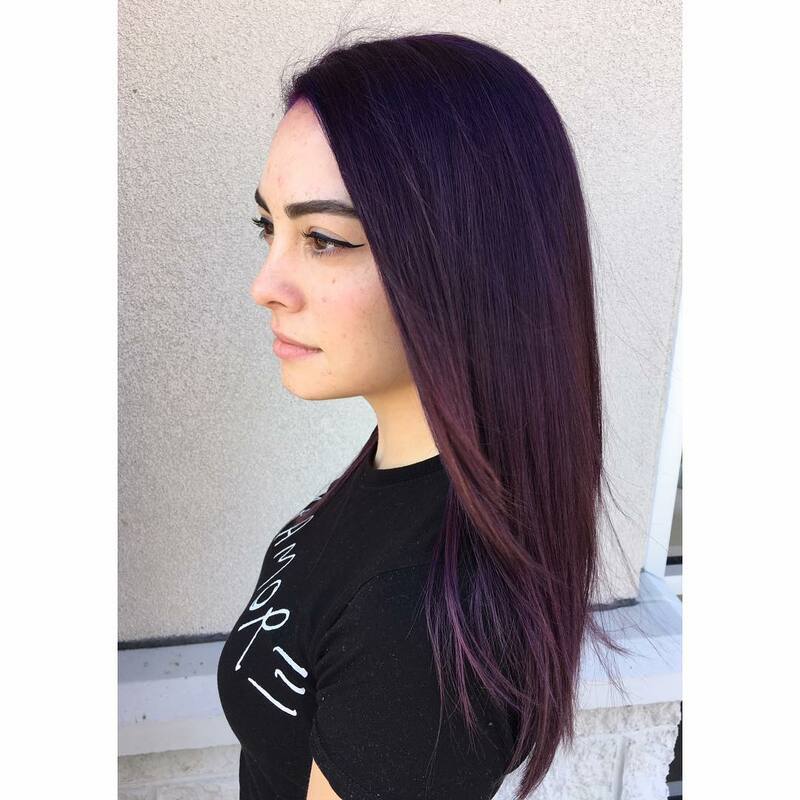 This design blends purple and a plum hue to give the straight locks a unique overall color and a layered brush back is all the styling you need. 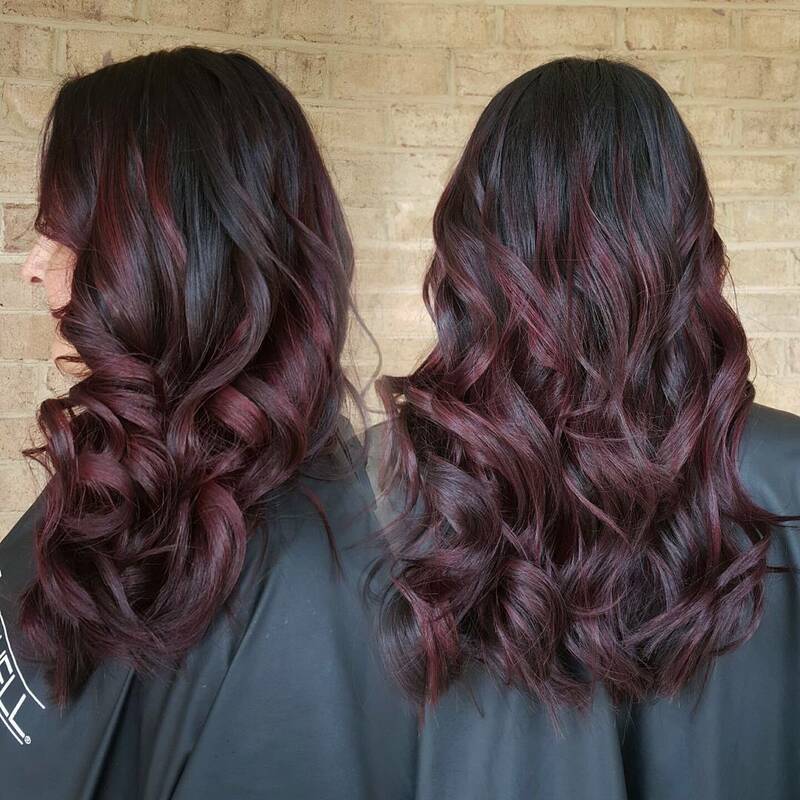 This beautiful hairdo has a typical red violet hair color, and it entails blending dark hues of the two to create a beautiful shade. Apart from the perfect blend of colors the smooth strands also have an amazing glow that makes the color more detailed and also makes the hair appear healthy. 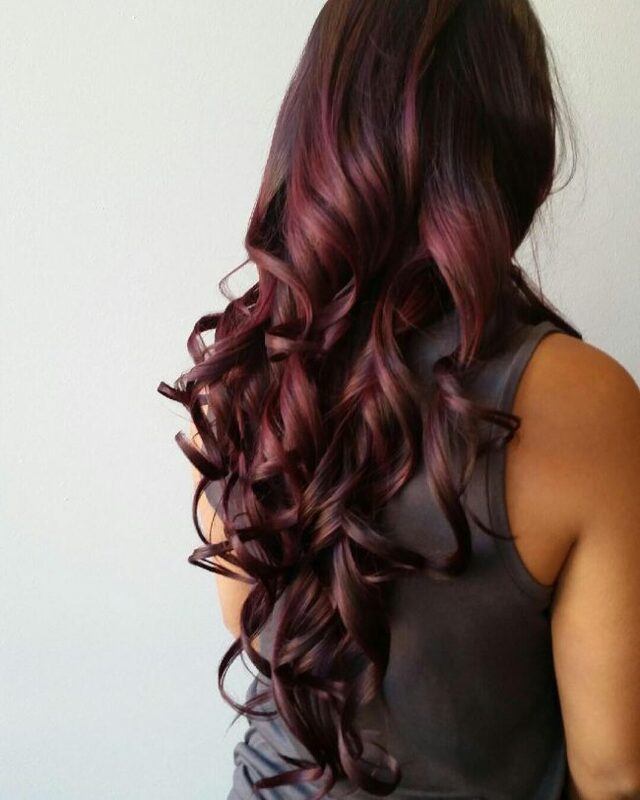 The red wine shade on this hairstyle is stunning, and it will make any woman look and feel like a queen. The beautiful color is throughout the head, and it has a unique shine that is enough to convince you to try it out. These blowout locks also have some lovely curls, and you do not need to do any complicated styling because they are already beautiful enough. If you have a natural wavy hair, you can spice it up by chopping it short and making the waves loose. And if you give your short loose waves a beautiful shade like this one you will look magnificent. 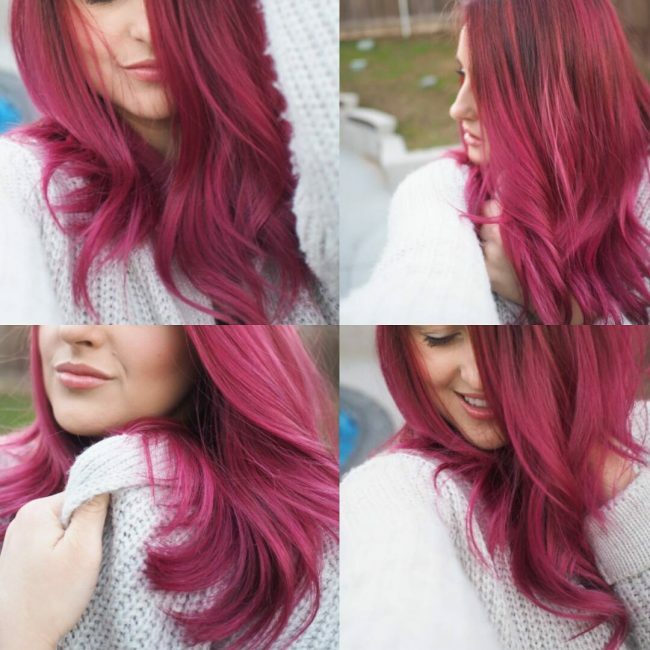 The color comes from melting red and purple hues and then enhancing them with a hint of pink to create a gorgeous hairdo. A-line bobs are the style that most ladies will turn to when they want to keep their hair short. 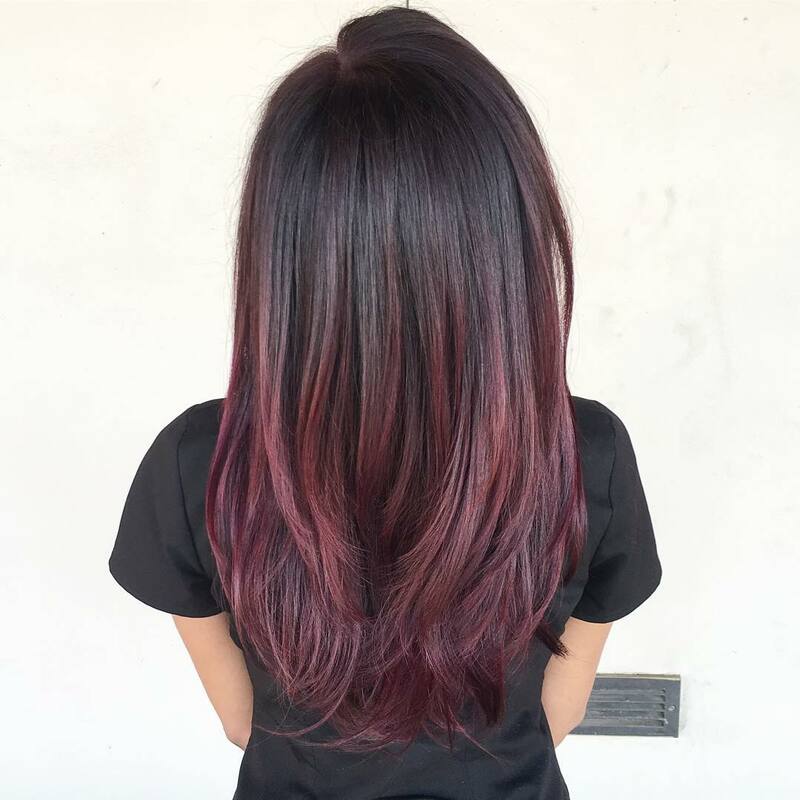 However, this particular one is a class above the rest because of its beautiful balayage red violet shade that gives it a breathtaking dazzle. 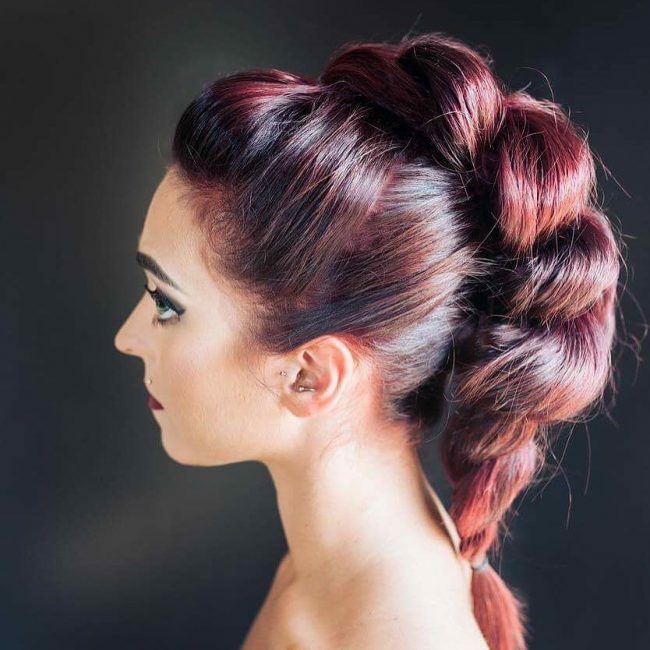 This funky fall hairstyle will work for any woman with a medium size hair. 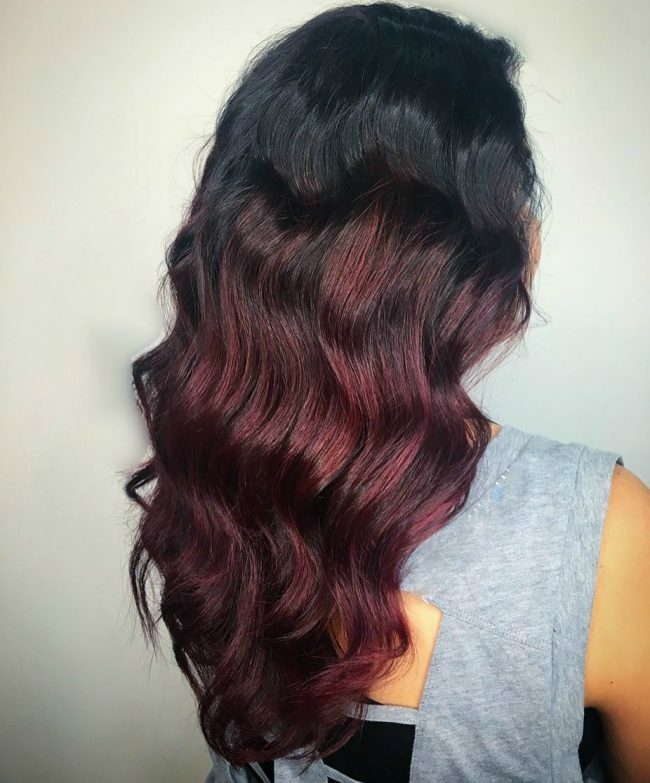 To create this look, you will first need to chop your strands for some texture and then use balayage to blend the violet red hue with your black hair to create a natural looking and dark overall tone. And to finish the look you only need to sweep back your hair and layer it slightly. The smoothness and uniformity of the red wine shade in this design are just splendid and if you can replicate it you can be confident of a breathtaking appearance. Although the red wine is the most dominant shade, the strands also have a touch of violets without which the color would not look this perfect. The soft and straight locks that you should style with a sweep back also help to enhance the overall appearance. 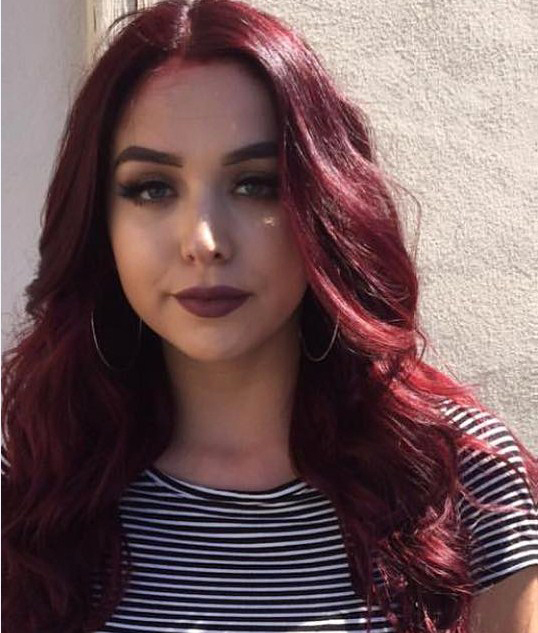 Red violet hair color is very versatile because there are many shades that you can use to create it, and this is what makes it suitable for all ladies. In this design, it comes from a dark merlot hue with a hint of purple, and it looks very stylish and unique. 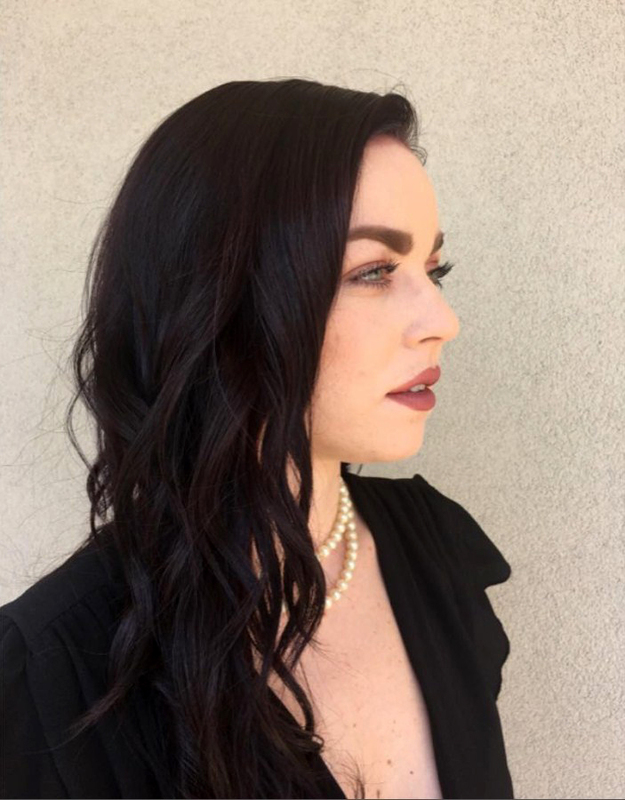 The straight shoulder-grazing hair also has a beautiful style that involves giving it a center part and sweeping the locks into a face framing style. These locks look very natural, and it is hard to tell that they have any artificial coloring. However, the choice of color is the reason behind this, and it involves blending a dark red violet shade with the natural black color and you should free hand paint it if you want to get this particular look. The side sweeping of the long wavy locks from a side part also adds to the beauty. The bangs in this haircut require some skill and precision to give them their beautiful asymmetry. However, they are still achievable but the color is the most important thing, and it entails blending your natural black shade with a subtle red-violet hue. You should then finish the design by sweeping the locks sideways. This design is very easy to achieve, and so it is ideal for a lady that does not feel like having something complicated. 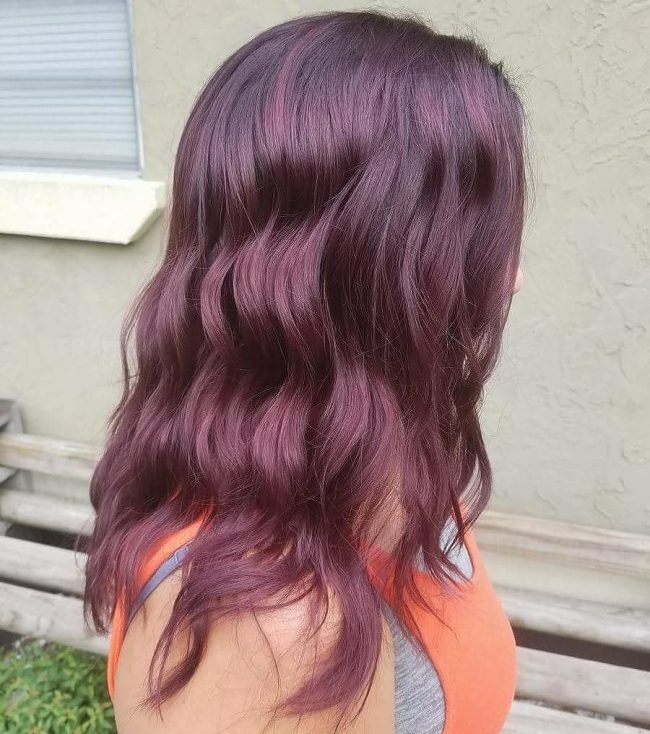 To create it you only need to use the balayage technique to paint a red violet shade throughout the head and make sure that you make it uniform for it to look as adorable as this one. Some ladies prefer to make their hairdos more exciting by giving them pastels shades that look very similar and so it is not easy to figure out the exact shades in the hair. This fancy headdress is a perfect example of this, and it entails highlighting the black hair with numerous shades that include red violet, maroon, and purple. Some shoulder-grazing locks with a fantastic color like these will make any woman look stunning. 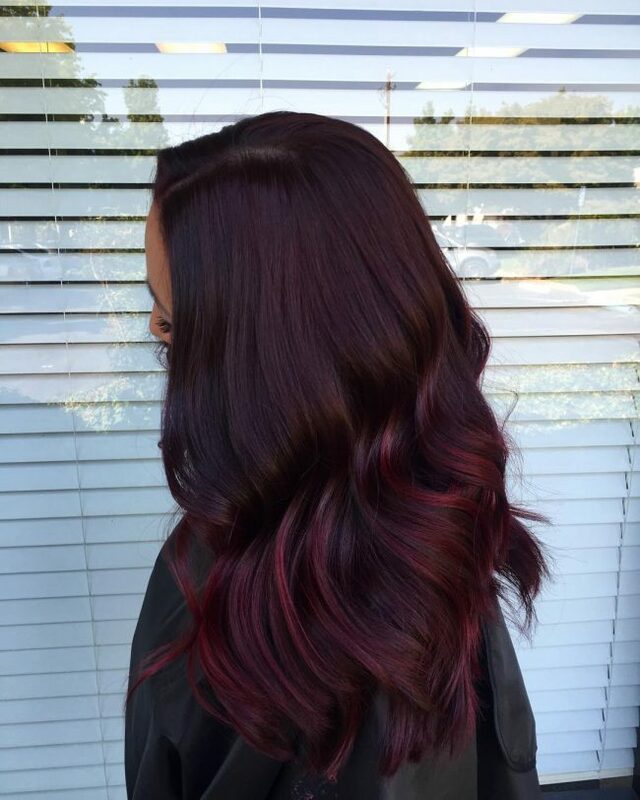 The shade is dark wine red, and it is uniform throughout the head, and you can create it using balayage or foils. To finish the design you only have to brush back the strands and stack them slightly. 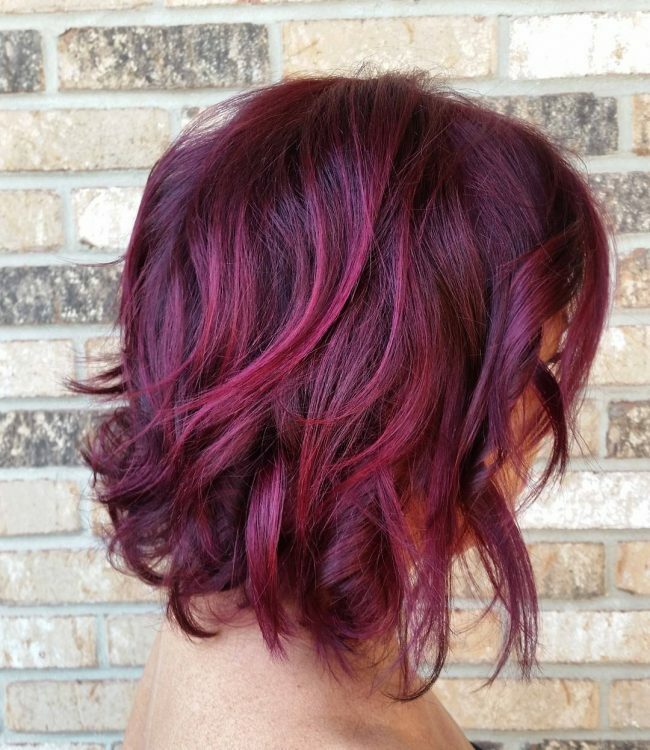 You can also create a beautiful redhead with red violet hair color. 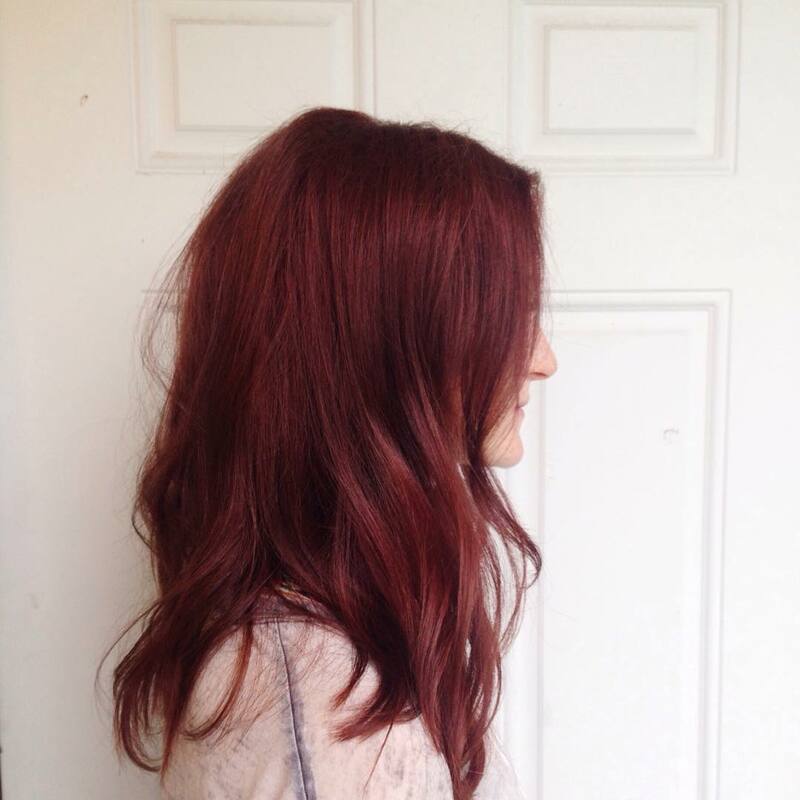 However, you need to choose some dark hues and blend them keenly with your natural black hair to create a merlot shade which is the unique redhead design. Giving your strands a nice textured cut is also important as this helps to enhance your beautiful shade. If you have some natural beach waves like these on your long mane, a lovely shade is all that you need to create a head-turning appearance. 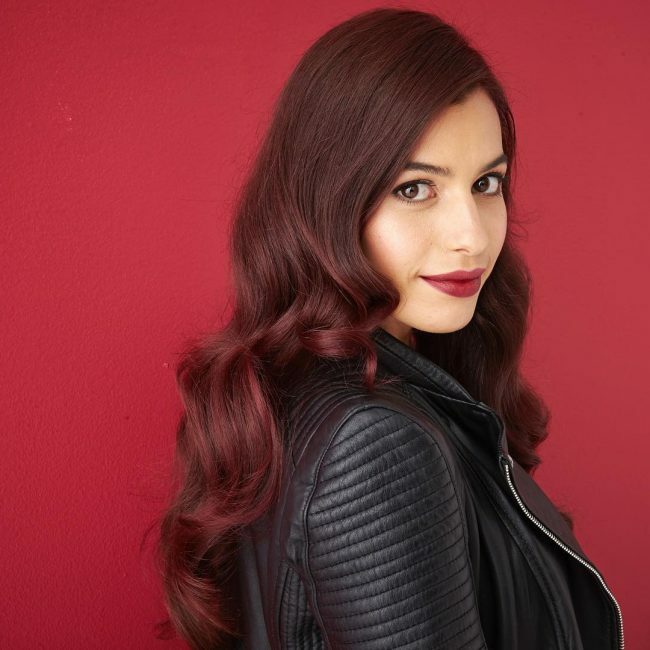 And for this a dark red hue is perfect, and you only need to make it uniform throughout and style your hair with a center part. When in doubt of how to spice up your perfect long bob haircut you can always play it safe with a red shade like in this headdress. 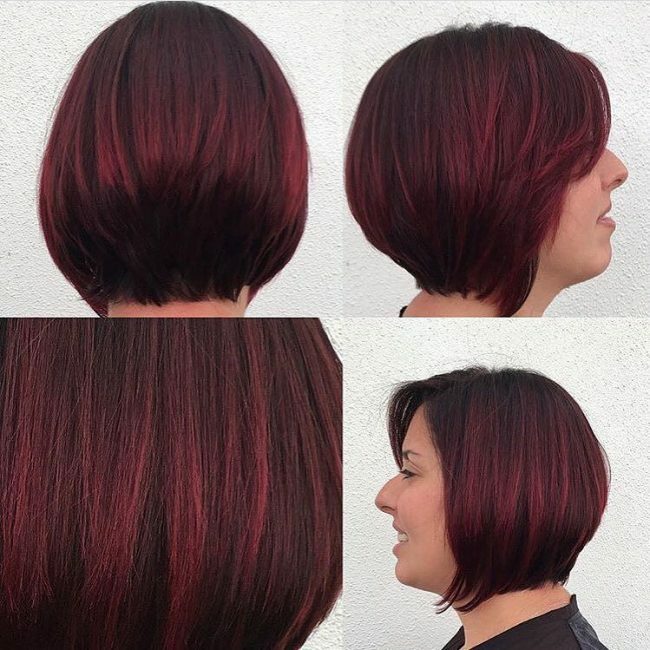 The smooth strands have a light red shade that brightens them up, and you only need to give it a hint of violet to create an adorable long bob hairstyle. 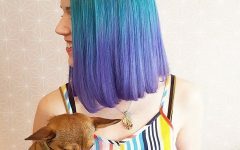 This hair color is the kind that you will want to keep for as long as possible because it has all the elements that ladies love including simplicity and elegance. 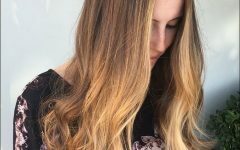 Although you can still use foils to create it, balayage is the best technique because it ensures that the shades look natural and that they spread uniformly. To achieve this lovely red violet hair color you have to choose your hue combinations carefully. And so it is a good idea to use the services of a professional. This red-violet hair color comes from introducing a purple hue to a plum base and making the ends of the short hair lighter than the roots to create a slight ombre contrast. The short locks also have some subtle waves, and you only need to run your fingers through to give them a messy finish. 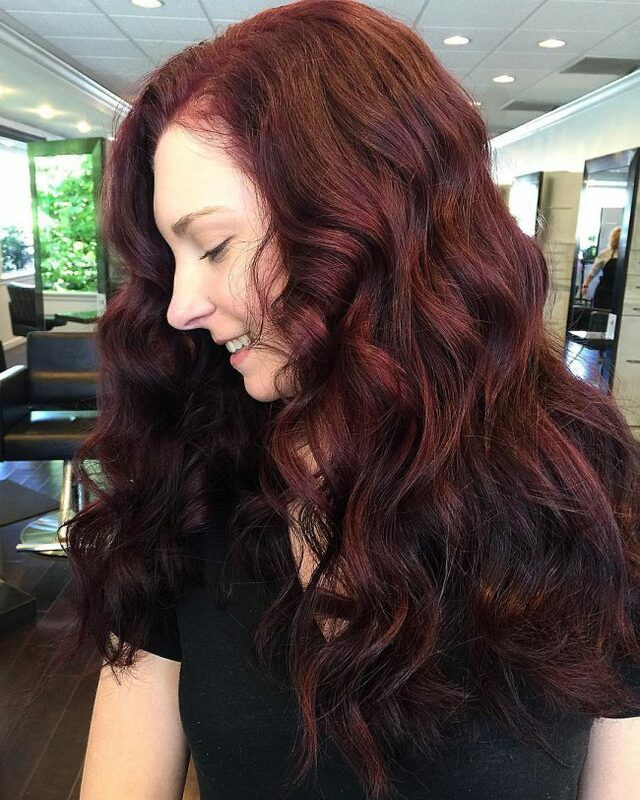 These retro waves look chic and fashionable, and this is due to their glossy red violet hair color. The dark tone of this shade blends with the natural black color to create an eye-catching shade. For styling, you should sweep the cute waves to the sides and over the face. The color on this hairdo has elements of both burgundy and merlot, and so you can call it what you like. However, the balayage technique that paints the hair to create the lovely shade is outstanding, and it is what makes this a top notch hairdo. The texture of the locks is also excellent, and it also enhances the lovely shade. Long hair is perfect for ladies because it gives them a big surface for their colors. However, even with a beautiful long hair like this, you need to choose your shades well. In this style, a dark chocolate hue forms the base and it transitions gradually to a blend of chocolate and red-violet on the ends to create a lovely sombre pattern. The air also has some beautiful thick curls and so you only have to give it a center part and sweep it back to style it. 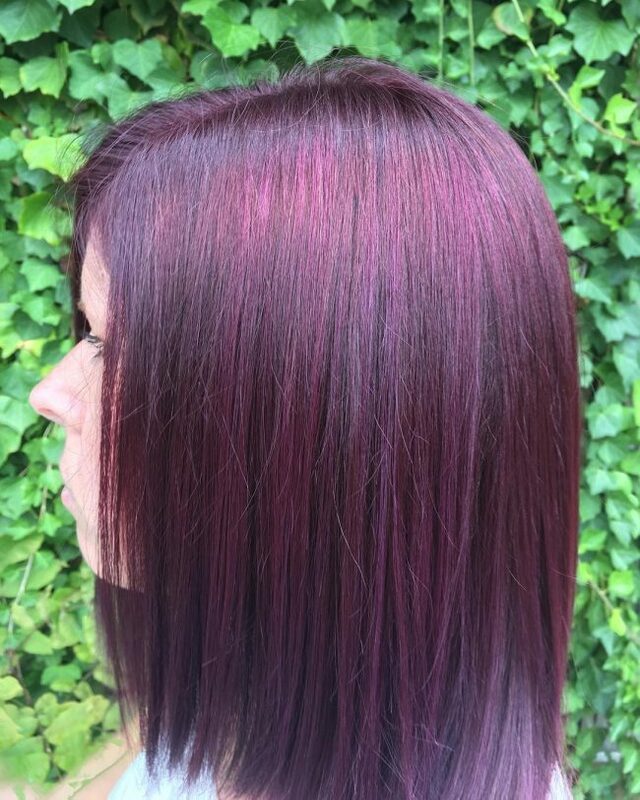 This beautiful shade is what you get if you blend red violet and burgundy. 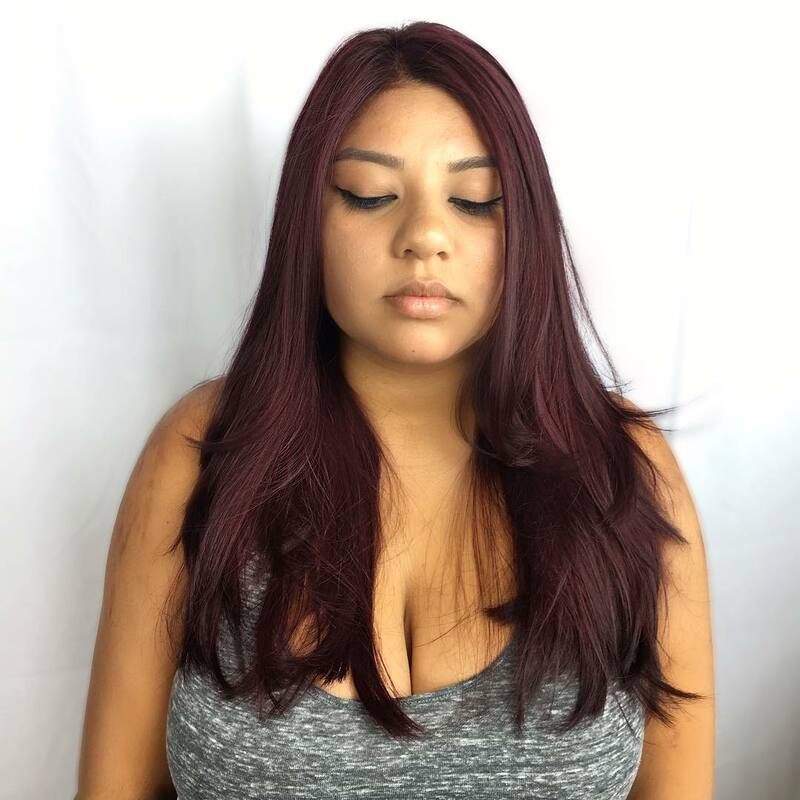 It is a natural looking color that you can achieve by free hand painting the hues, and so it is perfect for ladies that do not wish to make it evident that their hair color is not natural. The subtle waves on these locks also complement and enhance its beauty. 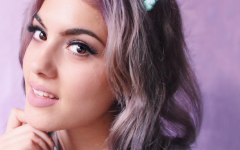 Purple is the most dominant shade in this hairstyle, and it is what most people will notice. 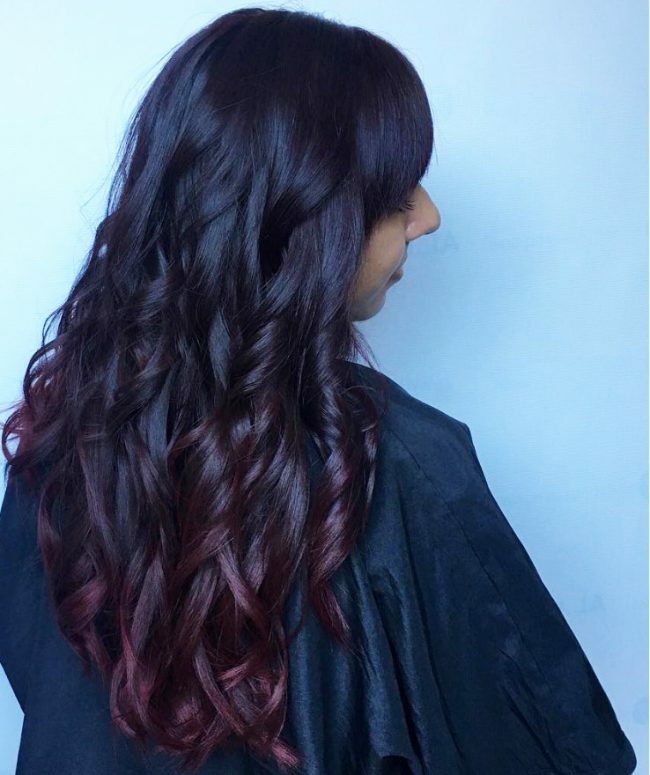 However, the beautiful shade would not be possible without introducing the hint of red violet. Apart from the color the locks also have some cute curls on the lower half, and you should style by throwing them to the front and over the shoulder. 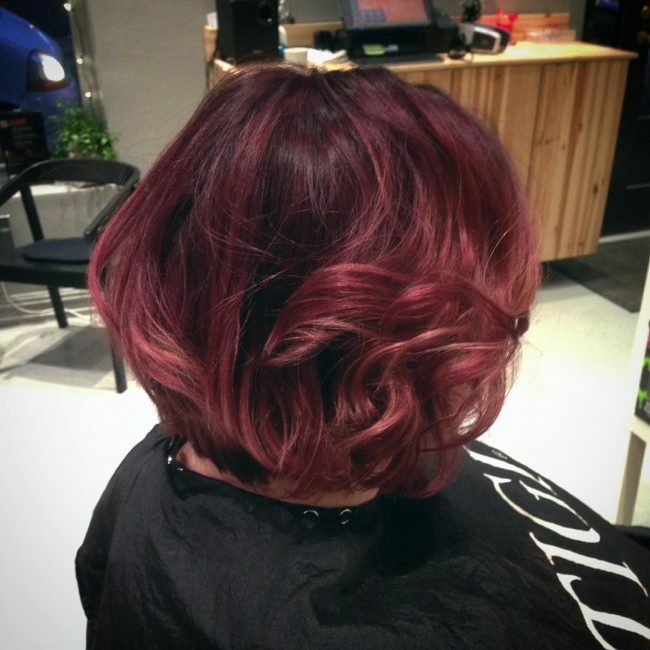 Plum is one of the shades that you can create by combining particular violet and red hues. 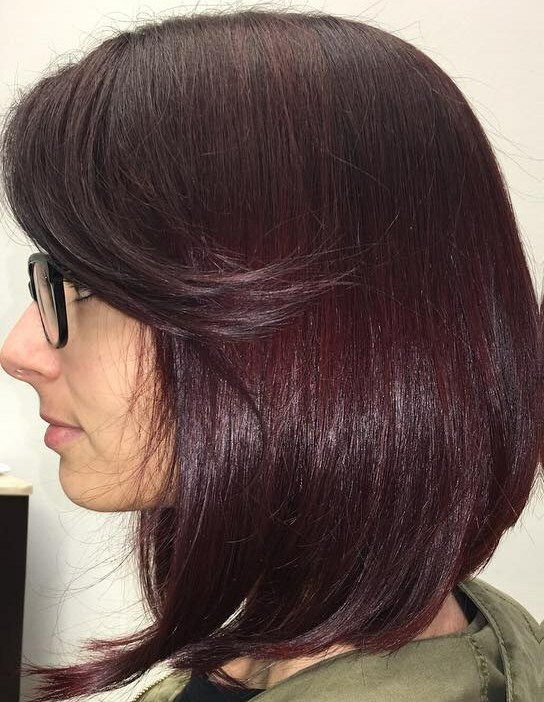 It is a beautiful and also unique tone, and it is what makes this short, blunt bob look flawless. 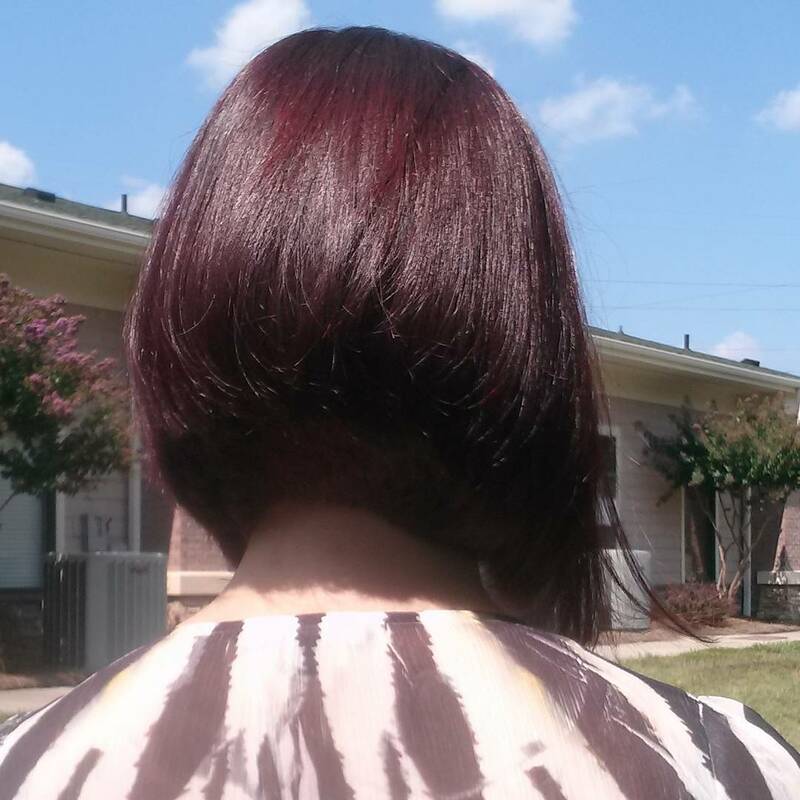 The shade is free hand painted on the bob haircut, and this is why it looks uniform throughout. Here is another fancy headdress that showcases the beauty that you can get by giving your strands a plum shade. However, the shade is very subtle in this hairdo, and it blends with the black base color to create a very natural looking tone. The long locks are quite thin, and so the side sweep and layering are perfect because they make them appear thick. 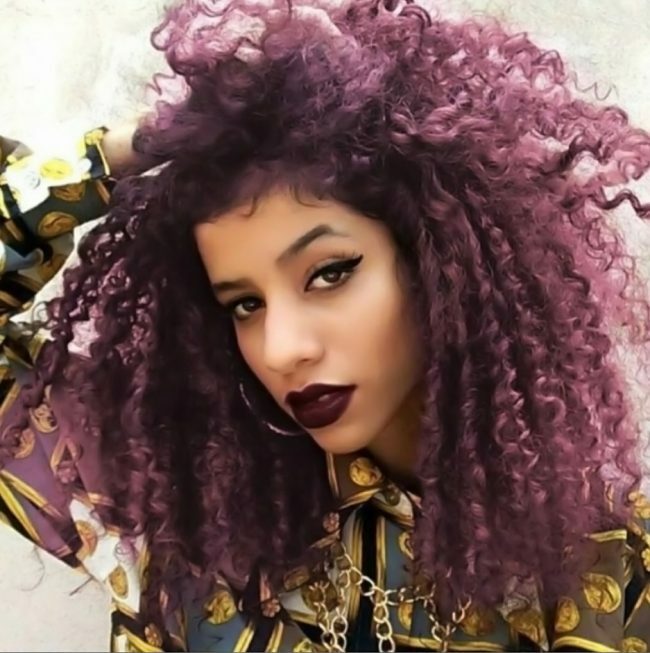 To create this charming hairdo, you will first need to paint your long and textured curly locks with a red violet hair color. 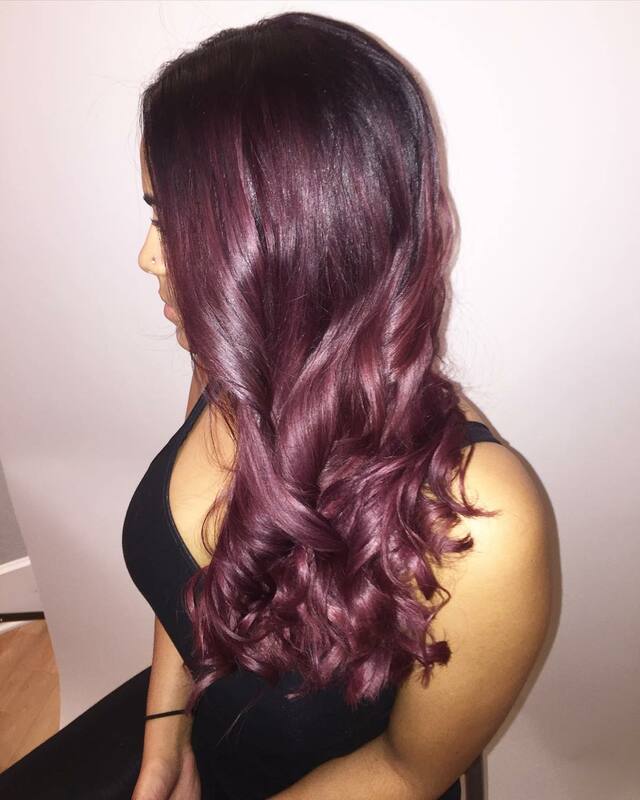 Once you have it throughout the head, you should introduce a dark purple hue through balayage to give your strands a distinct tone. 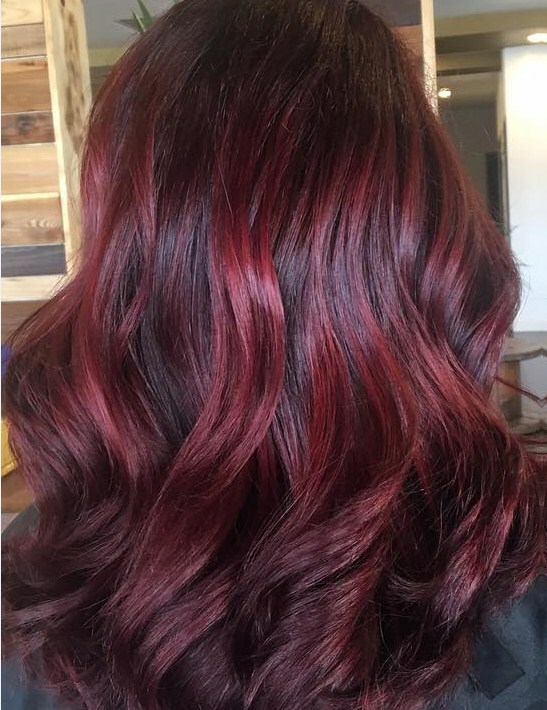 Redheads are beautiful, but if you want yours to look unique, you should choose your shades keenly. 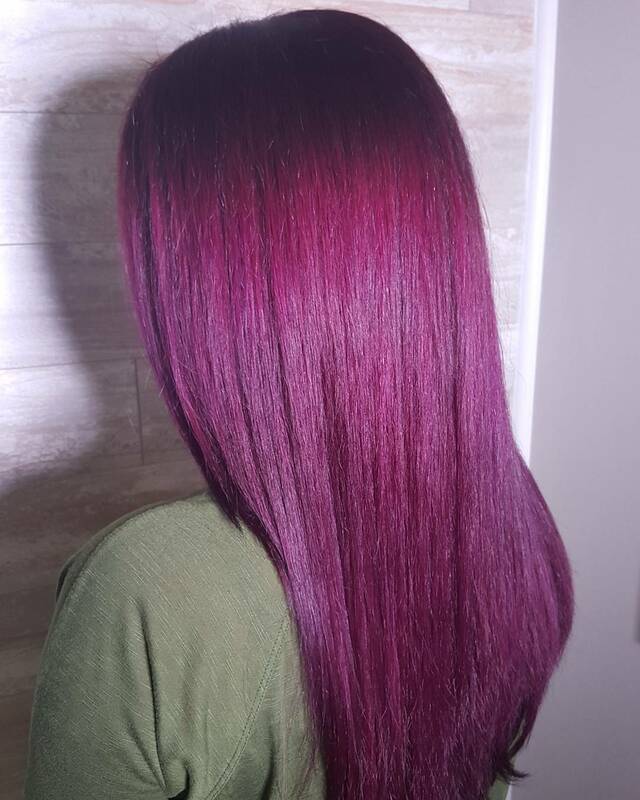 This design uses balayage to paint red violet on a long black hair to create a unique and adorable redhead. The long and thick hair also has some cute brushed out curls and so brushing them back and making the curls slightly messy is enough for styling. The transition from the black shade to the classic red velvet hue is splendid, and it creates a fabulous ombre pattern. This design also takes things further by forming some lovely waves that help to enhance the fantastic ombre color pattern and also add some elegance to the headdress. Ombre is one of the easiest color patterns to create and also one of the most stylish. 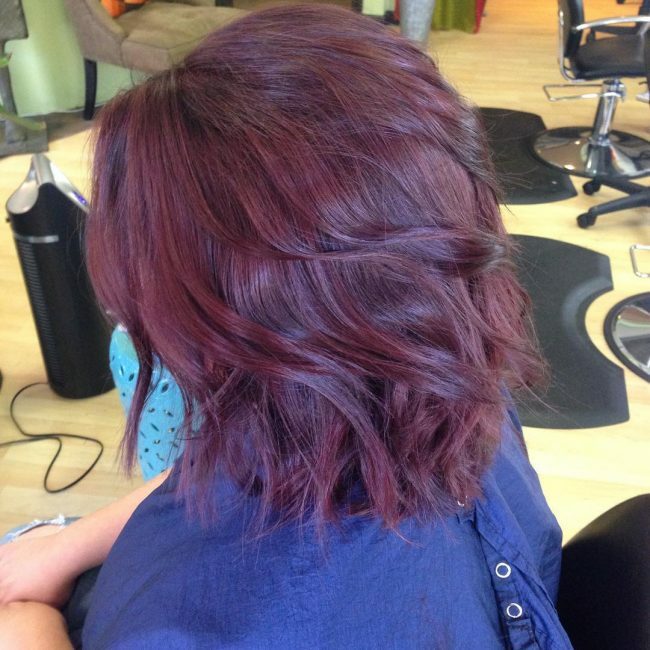 In this particular design, it comes from transitioning from a black shade to a blend of red violet and chocolate brown. The hair also has an excellent texture and some nice waves, and you should style by sweeping them to the side and layering. This thick mane would probably look good with any color because it has a perfect volume and some stylish brushed out curls. 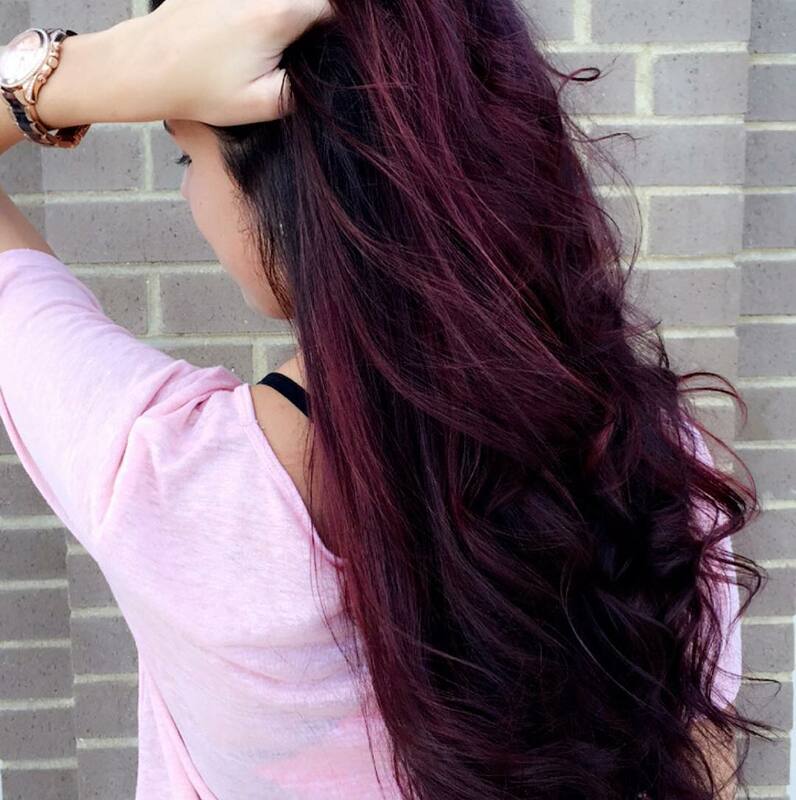 But, the introduction of the deep red-violet hue still manages to give the hair some extra elegance. The shade is throughout the hair, and it is also uniform, but you should leave some small patches with your natural hair color for some contrast and to spice up the design. A chin length hair like this one is easy to work with and so you should always make sure that you give it the best color. 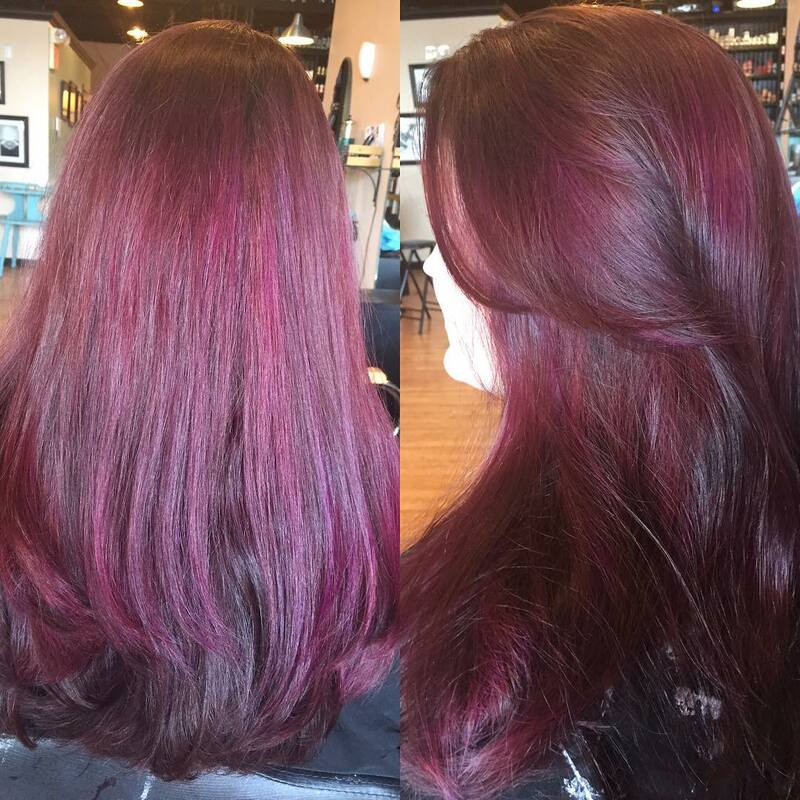 The hairdo entails shadowing the roots of your hair and then dying the rest of the strands with a dark and dazzling purple hue. These strands also have some lovely curls that you should style by making messy. The shade in this hairdo is more of a violet than a red, and its beauty comes from the fact that the hue is hand painted. This shade is almost uniform throughout but the ends are slightly brighter than the roots, and this creates a sombre-like design. Apart from this the hair also has some cute perm spirals that also help to enhance the design. A hairstyle like this deserves a second glance and it is hard for anyone to walk past you without staring at your hair. 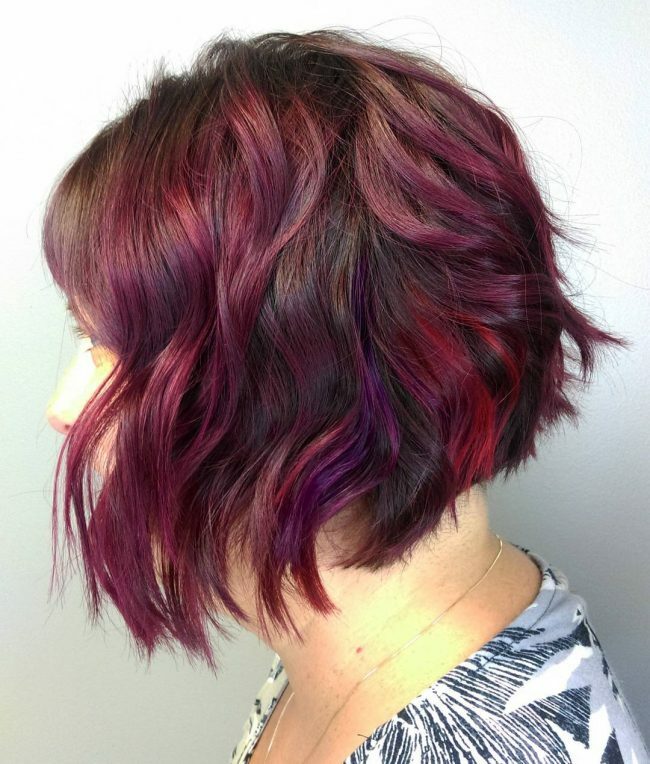 The eye-catching look comes from the creative use of colors, but it is also very easy because you only need to transition from your black base color to a dark red-violet hue to create an exquisite ombre design. The massive bubble braid on this hairstyle is as glamorous as you can ever wish for your hairstyle. 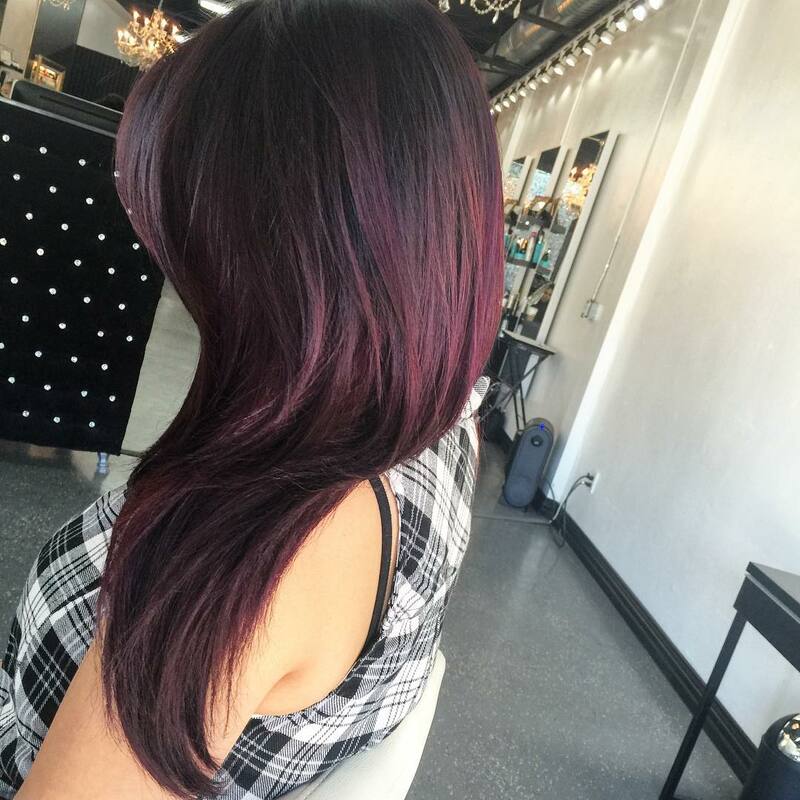 However, it would not look as gorgeous as it is without the beautiful red-violet and black blend. This hair also has an enchanting dazzle that will make every woman want to copy the style. 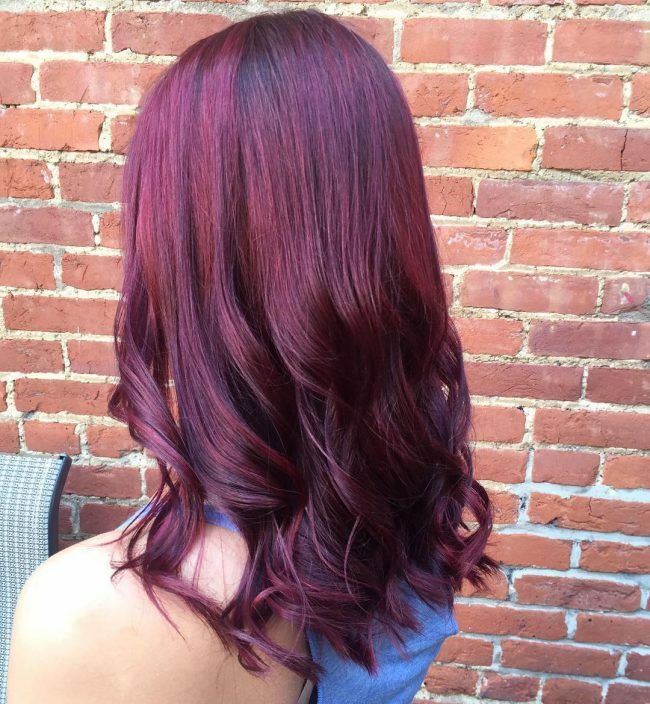 Red violet hair color is unique, and this alone is enough reason to have it because it will help you stand out from the crowd. What is even better, it perfectly works for most lengths and hair types. Look through the 50 breathtaking hairdos above for some inspiration on how you can wear this stylish shade.